Ancestor Archaeology: RootsTech 2017 ... From Home! It's that time again. Time for the Big Show. No, not Christmas. (But in a way Christmas for genealogists!) It's RootsTech time! And again this year I will be unable to attend. (insert frowny face here) Never fear! 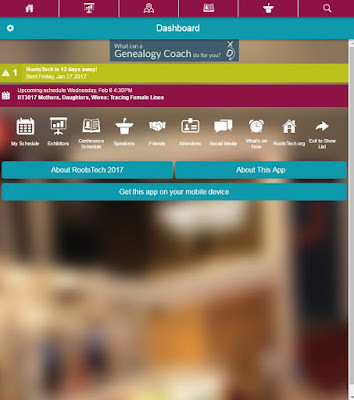 The folks at RootsTech have made some of their sessions available for live-streaming AND there's an app where you can download syllabus material to your computer or your phone. I'll be "attending" - maybe I'll "see" you there too! From the homepage: "Not able to attend in person? Several sessions at RootsTech 2017, including the general keynote sessions, will be streamed live on the home page of RootsTech.org. After the conference, recordings of these sessions will be posted on the website for a limited time." And you can download syllabus material with this desktop app!